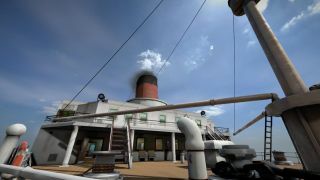 The Ship: Remasted, the HD remake of the 2006 multiplayer murder-mystery game of (almost) the same name, was supposed to be out on Early Access today. That date was confirmed as recently as last Friday, February 12—just three days ago. But if you've been waiting for it to happen, you will likely have noticed by now that it hasn't. The original plan was to release the game with only LAN support for the first few weeks, but the response to that idea was less than universally positive, and developer Blazing Griffin was worried about how that might affect the game's fortunes over the long-term. It has thus decided to hold off for another week in order to get online play working. “Relay server functionality” will go live today for testers, and while bandwidth limitations mean it's currently capped to four player games, it will allow them to play online without requiring any third-party services. The studio said it hopes to have that limit increased soon, and is also still working on dedicated server support, which it expects to have ready “within a few weeks,” as originally planned.